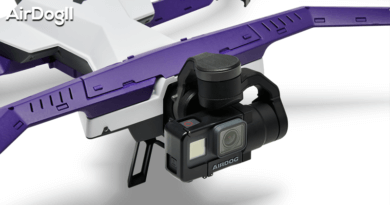 PolarPro is a Costa Mesa, CA, based company founded by a team of actionsport enthusiasts and cinematographers who create great products for anyone who wants to elevate their GoPro game. 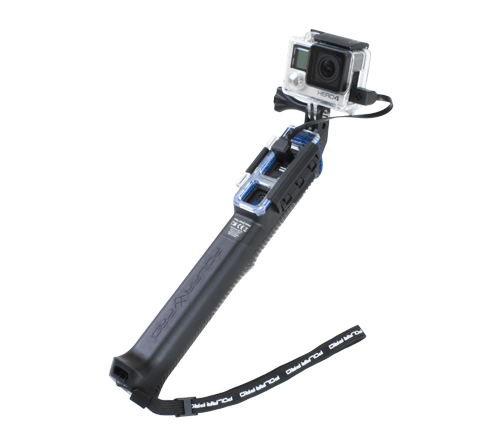 PolarPro PowerGrip H2O is a WATERPROOF GoPro battery system that you can use as a normal grip or assemble it into a 3-fold pole. The name PowerGrip means you are not just getting a good looking GoPro grip, but you will also get tons of extra shooting time thanks to the integrated battery. The product looks good even in the packaging, often times you can already make some assumptions based on how the product is presented before you even get your hands on it. The see-through window displays the grip beautifully and the rest of the items fit snug in the shiny box. There is no nasty heat welded seams, so you can repack nicely if you want to store it in the original packaging. What we love about the PowerGrip H20 is the build quality! The rubber grip is really ergonomic and the grooves in the rubber act like a tire, leading the water off, providing a solid grip even when soaking wet. The USB ports are sitting at the top of the pole right above your hand when you grip it. The PowerGrip H2O comes with two doors – a skeleton door for recharging and a solid door to protect the USB ports from water, dirt or any other crap you want to keep away from the ports. The doors are both clear, and transparent and changing them is really easy. 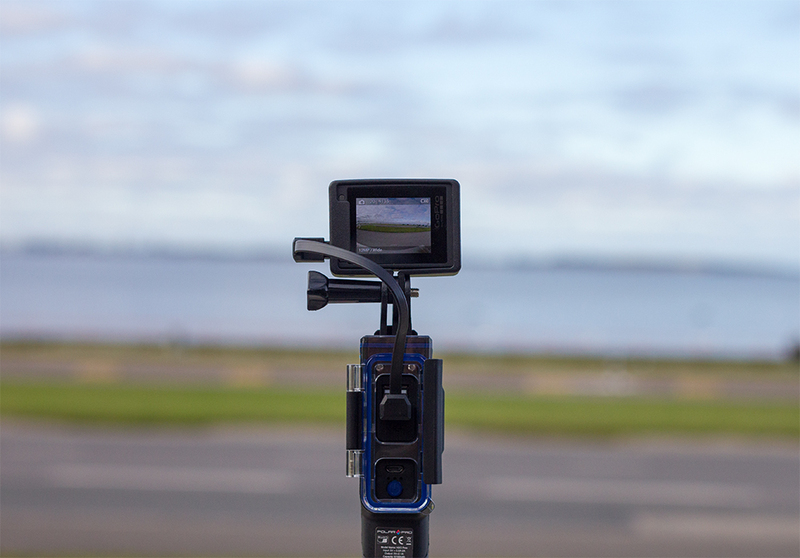 PolarPro uses a similar system like the GoPro camera housings – you clip on the door you want to use and use a latching system to seal it tight. You get 2 USB cables with the H2O system that you can use. 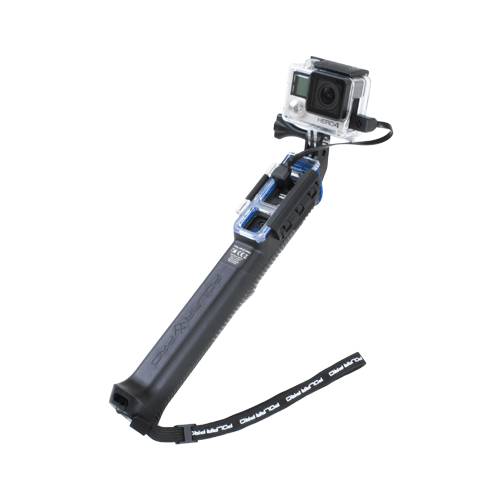 A really short 8-inch cable that`s perfect for live charging your GoPro and a longer, 30-inch cable. The short cable is a great idea, because if you use any regular USB cable it will dangle in your way and might get caught when you are moving around and filming. You can use the two USB ports simultaneously so if your phone dies you can hook it up to the PowerGrip H20 and charge it up. Since the phone bracket is already included you can also use your phone to shoot long time lapse videos while making sure you don’t run out of juice! You can pretty much use it as a waterproof battery bank for any device you can imagine that can be charged from a USB port. At the bottom of the PolarPro PowerGrip H2O you will find a standard 1/4 20 tripod mount, so you can rest the grip on any tripod for extended use. 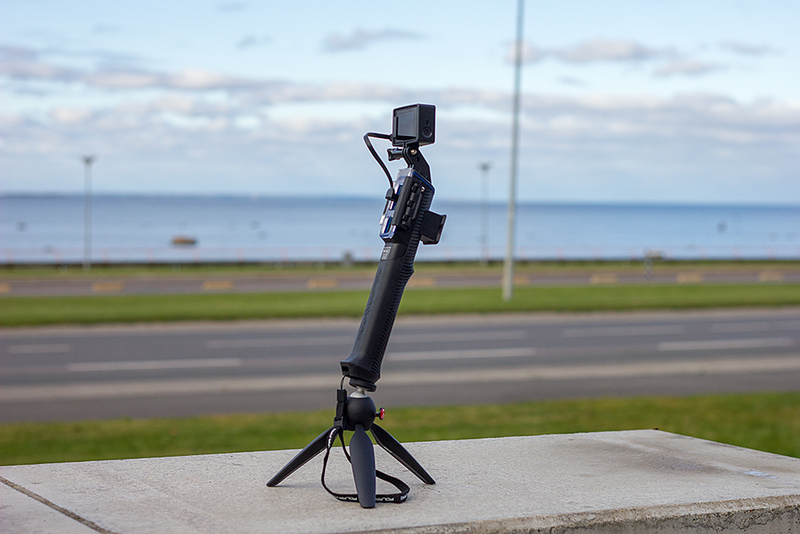 This really works wonders if you want to catch long time lapse videos – you just hook up your GoPro to the power outlet, stick the grip on a tripod and start shooting without worrying if you have enough power to leave the GoPro on for hours. 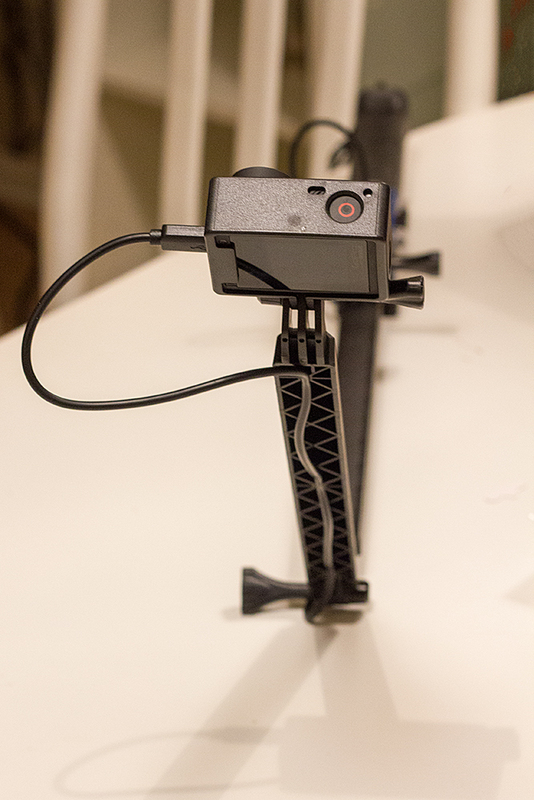 You can also mount it to any other GoPro mount if you screw the GoPro tripod mount at the bottom! 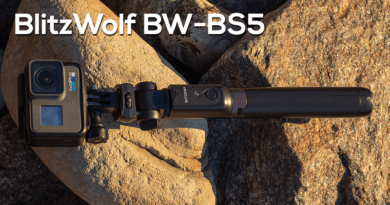 The two extension poles that are included can be added so you basically have 3 different lengths to choose from: 9.5-inch grip, 22-inch pole, 33-inch pole. You can use the longer cable and tuck it at the back of the extensions so it keeps the cable safe and away from snagging onto anything. One of the advantages of the folding system is that you can create an arc instead of a regular straight pole. 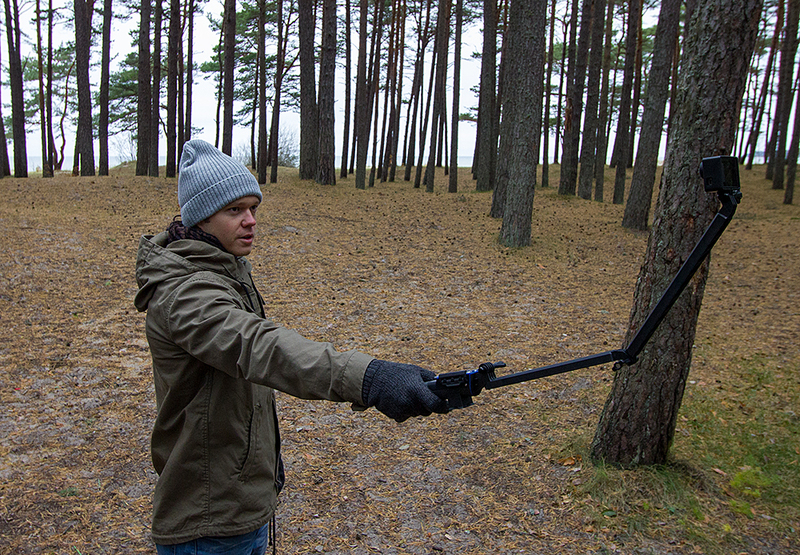 With the arc configuration, the pole won’t get in your shot and it will give you more creative freedom. On the other hand , it takes up more space and is not that fast to deploy. You need to screw them on one by one, so if you are in a hurry a regular slide-out pole works better. The screws that come with the H2o system are actually better than the original GoPro screws and I love them. It`s a small thing but if you use your cameras in cold weather or cold water it becomes so difficult to use the original screws. There has been many cases when my fingers become numb with cold water and I have to use my teeth to unscrew the GoPro, just because there just isn`t enough grip in the fingers. 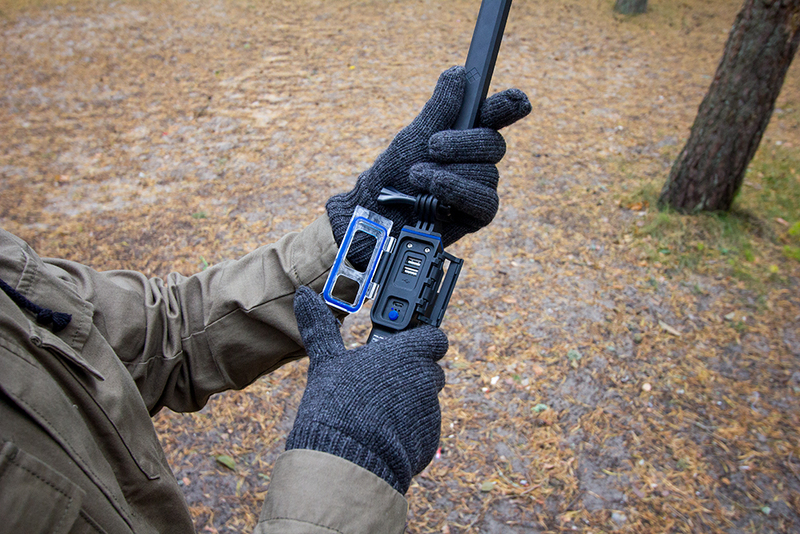 The PolarPro provided screws are flat and easy to use even if your fingers are blue from the cold. The lanyard is a nice touch and definitely something i would expect to get with a high-quality product like the PolarPro PowerGrip H2O, but it attaches with a really thin string so I’m not sure if i trust the lanyard to keep the grip safe in harder conditions. Another cool thing worth mentioning is the Smartphone Mount that comes in the box. It`s a solid mount with a tripod screw at the bottom, so you can use it with any other accessory you might have. If you happen to have a dual bracket at hand you can turn your PowerGrip H2O into a BEAST! I used aUKPro Pivot Mount and UKPro Dual Mount to create this magnificent setup. 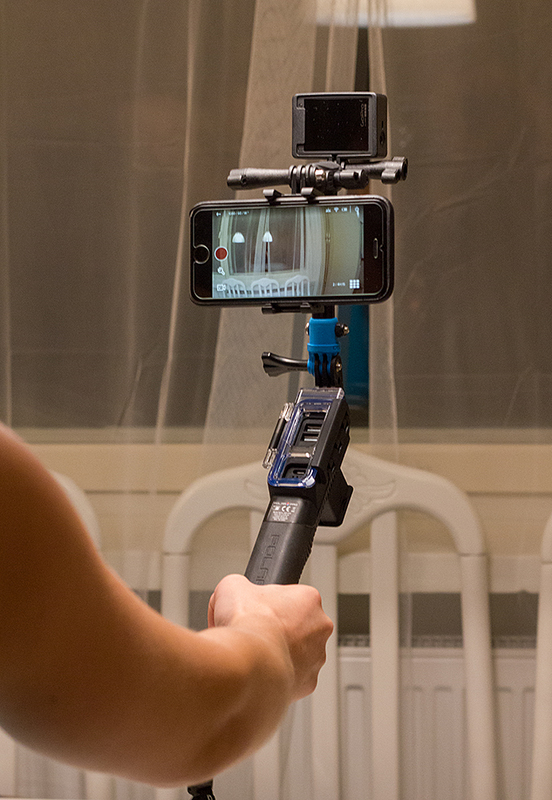 You can use your smartphone as a screen and the H2O system combined with the Dual Mount to create your ultimate, long-lasting video rig. You don`t have to worry about draining the battery on your phone because you can hook up the GoPro AND your smartphone. Since the PolarPro PowerGrip H2O has 2 USB outlets you can keep both of the devices connected and keep filming for ours! This is by far the coolest use we found for the H2O system, so if you plan on getting it, grab a dual mount to go with it. You don’t need the extra Pivot mount that we used, a simple 2-way bracket will work! The front of the H2O grip features a mounting unit that you can screw on. It`s a small rectangular piece of durable plastic that fits in the StrapMount. The StrapMount is not included with the PolarPro PowerGrip H2O so you need to buy it from PolarPro if you want to use it. 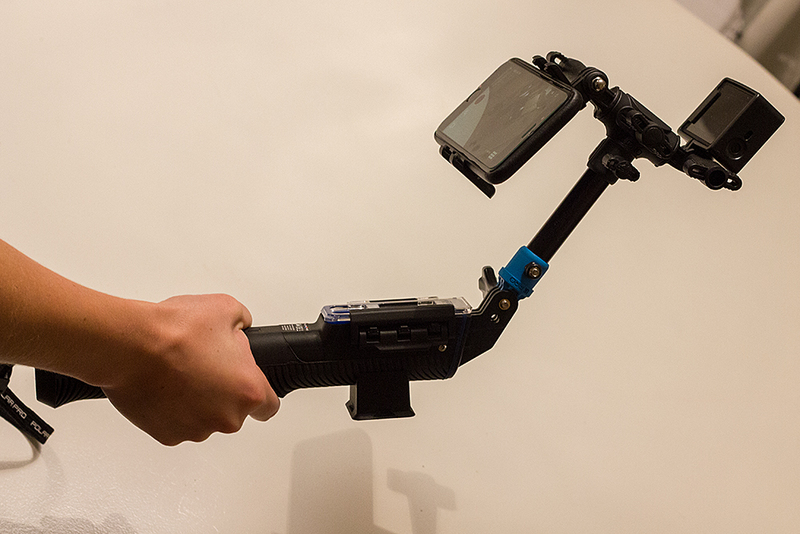 The StrapMount is a cool little clamp that turns any backpack into a GoPro mount. To use the StrapMount you first need to screw on the StrapMount connector which needs 2 small screws (included). This can be somewhat annoying if you are traveling and need to add or remove the peice and you don`t have the proper tool for it. Maybe some sort of a quick-release system would be good. You can slip the H2O into the StrapMount for storage and fast access or just leave the GoPro on and record video from your point of view. 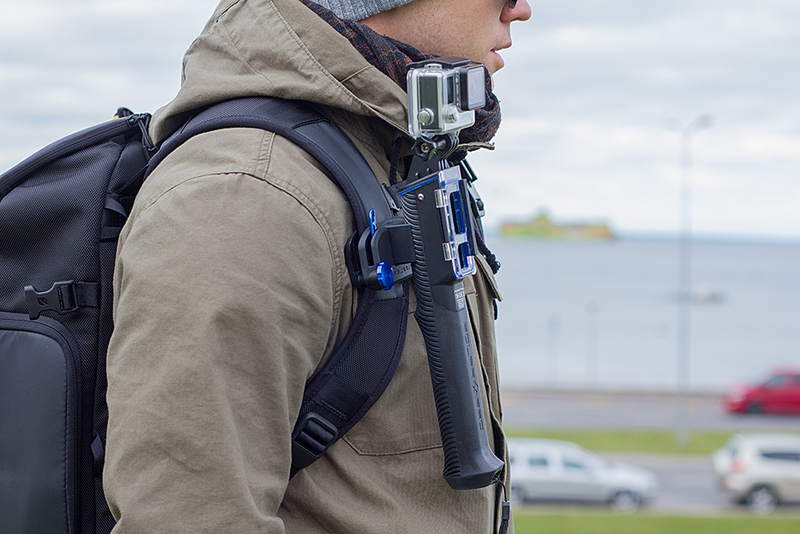 Read What GoProEssentials thinks about the PolarPro StrapMount. The number one enemy of any battery system is cold, so we tested the grip in 32°F (5°C) degrees to see how the battery holds up. We had both our GoPro and iPhone 6s hooked up to the H2O system for 2 hours with continuous shooting and heavy usage and we didn`t manage to drain the integrated battery of the Grip. We just got cold before we managed to deplete the battery. PolarPro promises up to 12 hours of live charging and that is pretty darn impressive. You can basically leave your chargers behind when you go on a trip and just take the POwerGrip with you. 6,700mAh lithium rechargeable battery is pretty impressive, that’s enough power to fully charge a GoPro camera up to six times via one of the two built-in USB ports. Build quality – every freakin` detail looks like they are made of top quality materials, and they are! Grip – the rubber grip feels solid and the grooves add grip even when cold or wet. Waterproof – You don`t need a separate pole for water activities. Huge battery capacity – Up to 12 hours of live charging, that`s sick! Versatile – add a dual bracket mount and turn it into a MASCHINE! The StrapMount connector – screwing it on means you need tools to operate, a quick release connector would be amazing. Wrist lanyard – The attachment side is very thin and we would love to see a better lanyard for such a good product. Get it! If you use your GoPro a lot and need to make sure you can keep filming without interruptions, this is the accessory to look at. Charging on the go is easy with the H2O system and you basically buy a device that holds a selfie stick, a pole, a grip, GoPro Charger, battery bank all in one device. Perfect gift idea for the fast approaching Christmas season. 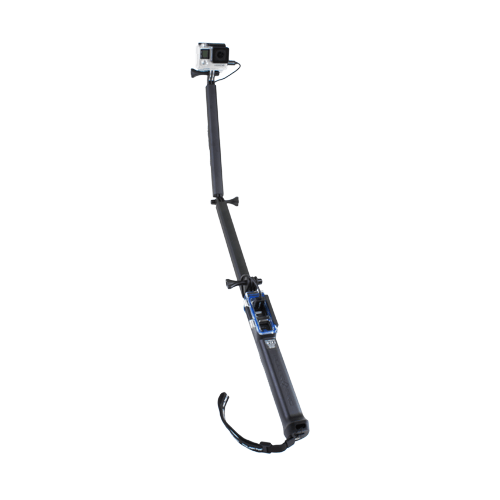 Pingback: 2016 holiday gift guide: Top GoPro poles - Get the best this year! 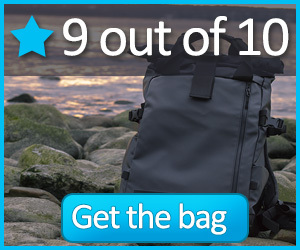 Pingback: Top 10 GoPro Accessories For Traveling vol. 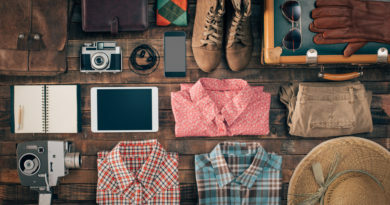 2 - Are you packing them?